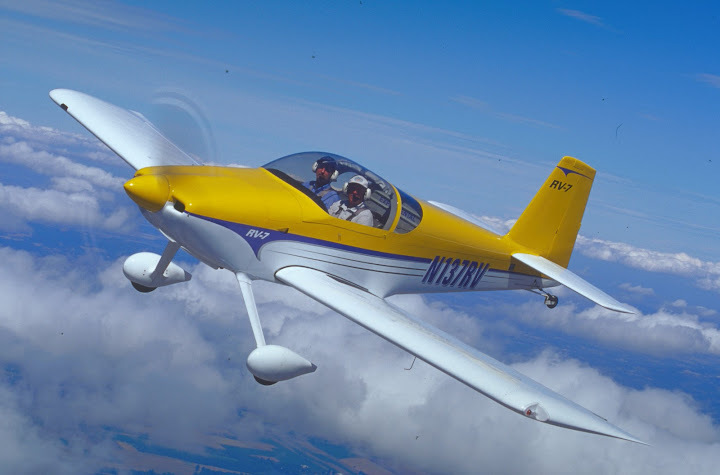 This blog documents the construction of a Vans RV-7 experimental amateur-built airplane in our garage in suburban Boston. I used the term “custom-built” on the front page tagline, since it sounds a little less dangerous than “experimental” and “amateur-built.” But now that you’re interested enough to have clicked on the “About Us” link, you’re gonna get the full story. The other “we” in this page and blog is my wife Ellen. She’s a whiz with a rivet gun. Are we really going to fly in this thing? Yes, we wouldn’t be spending more than ten fourteen years building it just to have it sit on the ramp. Is it safe? Yes, the airplane is as safe as any other when it’s flown by a trained, competent pilot. How fast is it? With the 180-horsepower engine we intend to install, the airplane will cruise at approximately 200 mph, or about 170 knots for all you aviators and/or sailors. How far will it fly? The airplane’s fuel tanks hold approximately 40 gallons of fuel. With calm winds, than means a range of 700 nautical miles. When will you be finished? Tuesday. Great time in Plymouth the other day! Progress looks good in the picture but I still have you. Keep banging away! Looks like we are close to the same spot on the build. What engine configuration are you considering? I was looking at a IO 360 Lyclone, but considering the price increases I’m reconsidering a used O-360. Not to mention the high pressure fuel pump and other stuff required. I’m still looking an an IO-360 clone, maybe one from Aero Sport Power. I’d love to go for the 200 hp angle-valve engine, but the difference in cost between that and the 180 hp version is enough to buy a prop. Awesome Christmas present from your awesome wife! The Aviation Museum of NH is having a Homebuilt Fly In on July 16, 2016. I’m wondering where you got the mounting ring for your Garmin GMU 22 magnetometer? Is that a Garmin part? I was looking at the Garmin universal mount but it’s just a well bent and drilled piece of sheet metal. Does that mounting ring have a part number? The ring and mounting plate came with Garmin’s GMU-22 mounting kit for the RV-7 and -9, the p/n for that kit is 011-01796-00. I ordered it from the local Garmin dealer. Student pilot and aspiring RV builder here. Just wanted to introduce myself as I live just south of you in Rehoboth MA. Hopefully I can meet you and Ellen someday, and take a look at your 7. Looks like you’re doing a great job. I’m sorry, I completely missed the notification of your post so my response is woefully late! You’re more than welcome to stop by the hangar sometime…feel free to contact me off the website, my email address is simply dave at the website name. Thanks for all you share! Could you let me know the part number for the Super Koropon from PRC-DeSoto that you are using? I am in the process of purchasing an RV-4/Harmon Rocket and the inspection turned up a lack of aileron stops. I see in your articles that you created some stops with nylon bushings and mentioned that you have a few left over. Would you happen to still have them? Unfortunately I don’t, sorry. I just gave away the last spare set I had several months ago and I forgot to remove that offer from the webpage you saw. Good luck with your RV/Rocket purchase!